Red Dead Redemption 2 is without doubt a stunning open-world adventure which sees you traveling the dusty roads and snow-capped mountains of the Old Wild West. However its HDR support doesn't seem to be quite right and now it seems we know why - it isn't HDR at all. According to tests performed by Eurogamer, Red Dead Redemption 2's HDR is actually rendered in upscaled SDR rather than HDR. These tests took screenshots from Red Dead and used a method to map luminescence of the image (which was then recorded in nits). The level of nits was then converted to colors (changing the color of certain parts of the image to represent the level of luminescence), and these colors were graded on whether they fell under SDR or higher. SDR was anything under 100 nits (showing as grayscale), 100 to roughly 500 was yellow, 500 to 1000 showed as orange, between 1000 or roughly 2000 appeared as red and images between 2000 and 4000 was pink (aka peak HDR). So, for example, an SDR part of an image would show as gray, while a HDR part of an image would be highlighted as pink. Surprisingly, when this test was applied to Red Dead Redemption 2's HDR output on the Xbox One X it showed that the output is upscaled SDR rather than HDR, with the screenshots highlighting the images in mostly yellow, orange and gray. Eurogamer claims that it was possible to hit a maximum of 500 nits, but only when the HDR calibration was at its maximum. Typically the average measurement of high dynamic range (or HDR) is 1000 nits. So Red Dead Redemption 2's HDR support isn't actually delivering HDR - rendering it useless. As Eurogamer point out, this isn't the first time a developer has promised HDR support and not delivered. Platinum Games were accused of implementing "fake HDR" in Nier Automata when it the game similarly did not meet the HDR baseline. 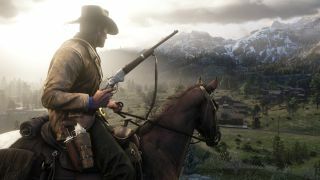 TechRadar has reached out to Rockstar for comment.